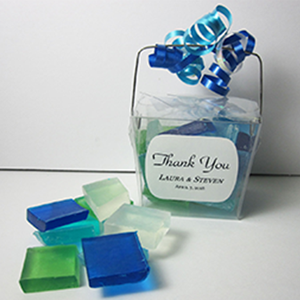 Personalized Scented Sea Glass Soap Wedding Favors - 3.5 oz approx. 20 pcs per box. The perfect wedding favor for your beach wedding. Can even be favors for bridal showers, baby showers, birthday parties or corporate events. Please included the Bride & Grooms name and wedding date in the comments section. We can customize the label to read whatever you would like as long as it fits on the label. Favors are made to order and require 5-7 Business days to complete before they ship. Larger quantities could require a little extra time. In a rush? need them faster?? Contact us and we will see what we can do to help! Based on the total number of favors ordered shipping could be less than charged, so any overages will be refunded once order is packed up. All favors are made by hand are require the same amount of time to make so we are unable to offer quantity discounts at this time.